Fond of taking your camera gear on outdoor adventures in all weathers? Check out our list of the best camera backpacks, but also take a look at Tenba’s new Axis backpack range for photographers and videographers. 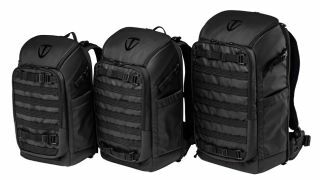 Inspired by Tenba’s military bags, these three new backpacks are the toughest the company has yet produced. They’re equipped with a special hydrophobic exterior that has been treated for maximum water resistance, as well as YKK zippers for top-notch security. The bags are available in three flavours – 20L, 24L and 32L. All come sporting a new height-adjustable airflow harness, which has been specially developed by Tenba and can be customised to fit almost any torso size, allowing for micro adjustments to the strap to ensure precise fit and comfort. It’s made with perforated foam and ventilated mesh, meaning there’s a good level of airflow to help you keep cool in warm weather, and there’s also a removable hip belt for a little extra security. Exterior pockets are built with Tenba’s MOLLE webbing, which is not only highly expandable and good for packing in all sorts of extra pouches for accessories, but is also reflective, making you more visible if you’re walking on dark paths or roads. There’s a front pocket for cables and batteries, as well as a padded laptop sleeve (15 inches in the 20L, 17 inches in the 24L and 30L), and it’s also possible to attach a tripod to the bag’s exterior. Capacity: 1-2 mirrorless or DSLR cameras with 5-7 lenses, up to 300mm f2.8. Capacity: 1-2 mirrorless or DSLR cameras with 6-8 lenses, including up to 400mm f2.8. The Tenba Axis backpack range will be available from October 5th. Prices are as follows: £180 for the 20L, £200 for the 24L and £225 for the 32L.